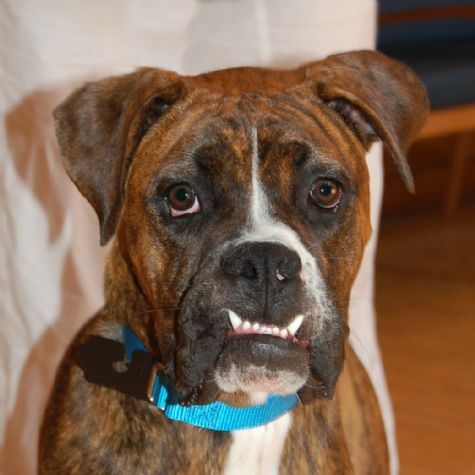 My name is George, and I'm a pure bred nine-month-old brindle Boxer. My parents named me after my namesake George Foreman since I look a lot like him. Check out his latest pictures!! Although my picture does not do me justice, I'm very good looking and friendly. I'm just a big, lovable, goofy doggie bear who loves to snuggle with the patients I visit in the hospital. I love to lie on the grass, play fetch, and eat, but most of all I love bringing smiles to people and brighten their day!